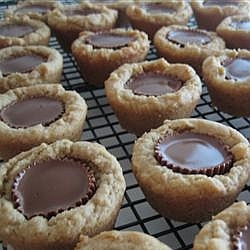 My homemade peanut butter cup cookie recipe is worth it's weight in gold. Peanut butter cookies with a peanut butter cup in the center - so good. Cookies so good you may not want to share. If you love Reese's, you'll flip for these cookies (so will everyone else). More cookie recipes at the end of the page. PREHEAT oven to 375 degrees. You will need mini muffin pans; ungreased. Sift the flour, salt and baking soda together; set aside. Cream the butter, both sugars and peanut butter until light and fluffy. Add the egg and beat for 1 minute. Now add the vanilla and milk; mixing well. Divide the dry ingredients into thirds and add 1/3 of the dry ingredients at a time; beating well after each addition. Chill dough for 1 hour. Shape into 40 balls and place on the cookie sheet. If you have some left over, keep chilled until the other batch is done. Bake for 8 minutes. Remove from the oven and let cool for 5 minutes. Unwrap the frozen mini cups and press one into each cookie ball. Cool and carefully remove from the pan. You may use the smallest cookie scoop you have, then all of the cookies are uniform in shape. You can also bake them on cookie sheets.